The header for this blog describes it as “A blog for runners in and about Addison County, VT”. While all of my previous posts have been describing runs in Addison County, this posting chronicles a run not far from our fair county, in the “Vail of Vermont”, Stowe. Since a drive to Stowe isn’t that big a deal, and this run involves a well-known Vermont landmark, I figured I might as well include it. I was looking around for a more epic run to finish off the summer, and I learned of “The Race to the Top of Vermont”, a charity race in support of the Catamount Trail, in which a few hundred endorphin-crazed runners and mountain bikers compete up the Mount Mansfield Auto Road to the saddle between the two prominent summits (aka “The Nose” and “The Chin”) of our own Vermont high point, Mount Mansfield. 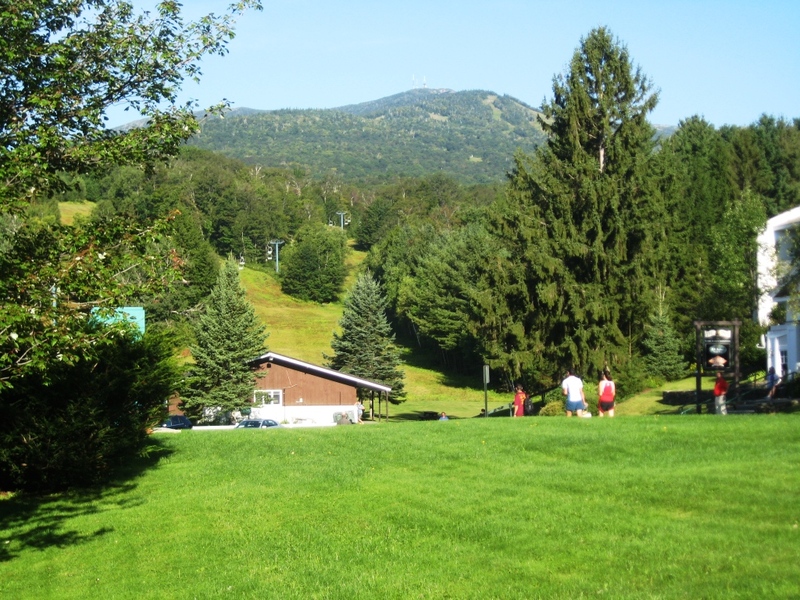 While I enjoy running the hills, I had only attempted a run of this magnitude once before in my life, and it HAS been a few years since my run up Jay Peak…. The last Sunday in August was a perfect day for a race like sort – warm at the base of the mountain, cool, but not too cold at the top, with the perfectly cloudless azure skies of the sort that one expects in Colorado, not Vermont. I must confess, looking up at the summit from the start line did get my heart pounding, even before the starting gun went off. 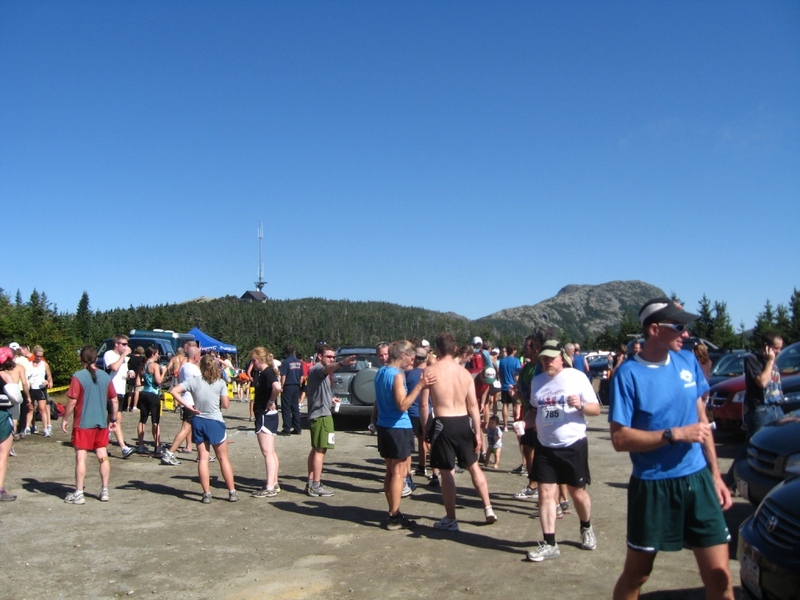 I had never hiked on this side of the mountain during the summer prior to this race, preferring the trails up from Smugglers Notch or Underhill for my frequent hikes to the summit. 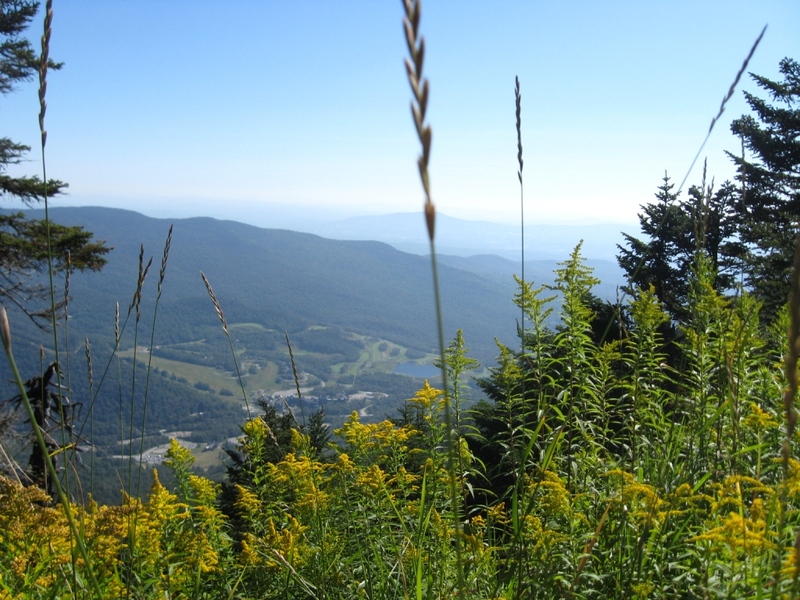 Nonetheless, I had descended much of the route many times in the course of the Stowe Derby, a cross country ski race from the top of the Lookout Chairlift on Mansfield finishing in the village of Stowe. Even though it has been a few years since I last competed in this little bit of downhill mayhem, I was pleasantly surprised by how well my memory of the Auto Road served me, albeit from a very different perspective – it always looks steeper going uphill. I chose a conservative pace at the start: Some of those who took off like a bat out of hell were passed by as they fell by the wayside, and some were never seen again until the finish line. I chose an initial strategy of running the straightaways, and “power-hiking” the steeper pitches around the countless hairpin turns. I must confess that as the run got closer and closer to the summit, my fast-walking sections became more numerous, and of longer duration – this was a very tough route! Fortunately, most of the other “middle of the pack” competitors had similar issues. While most of the dirt road course was shady, as it got higher up the mountain and crossed ski trails more frequently, every bend in the trail seemed to bring on an even more spectacular view. The finish line, where there is a small parking lot for drivers, while a few hundred vertical feet and about a mile from the true summit (“The Chin”), sure felt like the top! Prior to the start of the race, I had delusions of maybe finishing the run with a jog across Mansfield’s spectacular above-timberline ridge and bagging the actual summit, but in recognition of the fact that I still had to get myself back down the mountain on increasingly wobbly legs, I decided to save the ridge run for another day. The only disappointment of the day came when I thought that I might instead take the short walk to the summit of the “Nose” the secondary summit just above the top of the Auto Road where the prominent radio towers are located. The trail to this bump on the ridge had a barrier across it claiming it was closed due to new Federal safety rules on radio frequency exposure! Most people know that there have been increased concerns expressed about radio wave exposure due to publicity about possible health risks from cell phones. What most people don’t know is that the claim that radio waves can cause cancer actually flies against some of the most basic laws of physics, which Einstein figured out in 1905, and are well understood by beginning college chemistry students. There are many aspects of cancer which are not understood, but one thing is certain – to cause cancer, you need to break chemical bonds, and the energy generated by radio waves is only a tiny fraction of a percent of that necessary to do this. Saying that prolonged exposure to radio waves, or exposure to higher intensity radio waves can cause cancer is tantamount to claiming that if you stand on the Maine coast throwing baseballs for extended periods of time, one of the balls will eventually land in Europe. So….a scenic point in Vermont is taken away from us based on voodoo science. Enough of the rant of the day…..Most trail runners know that the climb up is harder on the lungs, but the descent is actually tougher on the legs. I thought I had enough strength left in my legs to do the descent as an easy jog, but discovered about halfway down that this was not the case, making the last mile or two of descent more of a fast hike than a running descent. I tried to get down promptly however, given the barbecue lunch awaiting me at the post-race party. 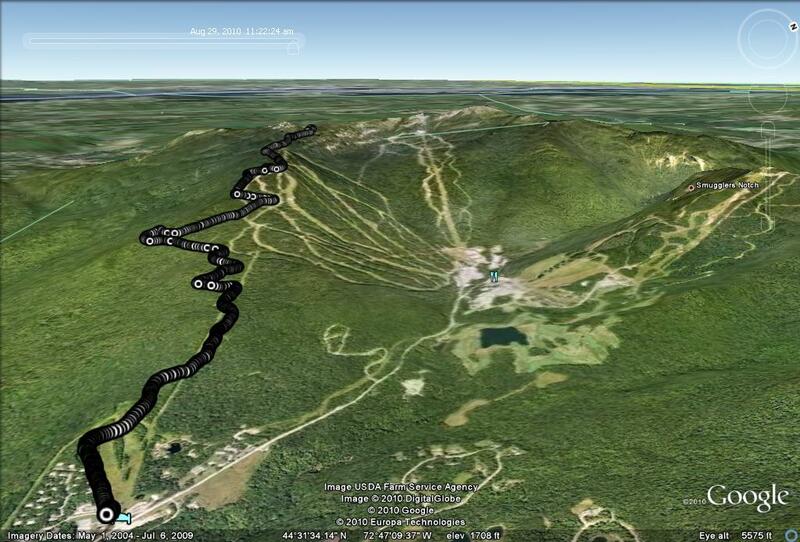 All in all, this run was 4.3 miles each way, or 8.6 round trip, with a 2500 vertical foot climb and descent. What a day!